Concord, NH – The New Hampshire Department of Health and Human Services Division of Public Health Services has announced that there has been a significant increase in the number of people in New Hampshire diagnosed with hepatitis A. The rate at which cases are being reported are concerning; 33 hepatitis A diagnoses were made in March alone. Since November 2018, 79 people have been diagnosed with hepatitis A, compared to an average of 6 – 7 people annually in recent years. The hepatitis A cases diagnosed since November have occurred in the counties of Hillsborough (36), Strafford (17), Rockingham (10), Merrimack (10), Cheshire (2), Grafton (2), Sullivan (1) and Carroll (1) Counties. One person from Merrimack County has died. Hepatitis A causes inflammation of the liver; severe infections can result in liver failure and even death. Symptoms include fever, tiredness, loss of appetite, nausea, vomiting, abdominal pain, dark urine, clay-colored bowel movements, joint pain, and jaundice (yellowing of the skin and eyes). There is no specific treatment for hepatitis A.
Eighteen states have declared an outbreak of hepatitis A. More than 15,000 cases and 140 deaths have been reported in the US. 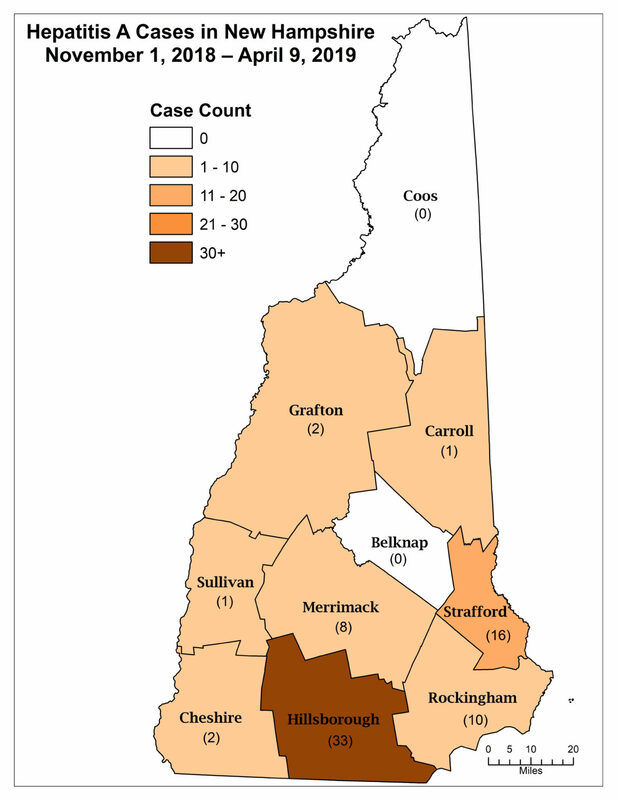 For more information on New Hampshire’s outbreak, visit www.dhhs.nh.gov/dphs/cdcs/hepatitisa/hepa-nh.htm.